The Back of Yards neighborhood in Chicago is known as a gritty, working class area. Once adjoined to the Union Stock Yards, which at one time processed more livestock than anywhere else in the world, Back of the Yards has always been blue collar and middle class. The neighborhood has also always had a substantial immigrant population, at one point being predominately Eastern European but mostly Hispanic since the 1970s. Since the Stock Yards closed in 1971, Back of the Yards has been without an economic anchor, forcing the neighborhood to find another way to support itself. This was the environment Jesse Íñiguez and Mayra Hernandez grew up in. Jesse is the son of Mexican immigrants and "planted [his] roots" in Back of the Yards, despite most of his family eventually moving out. 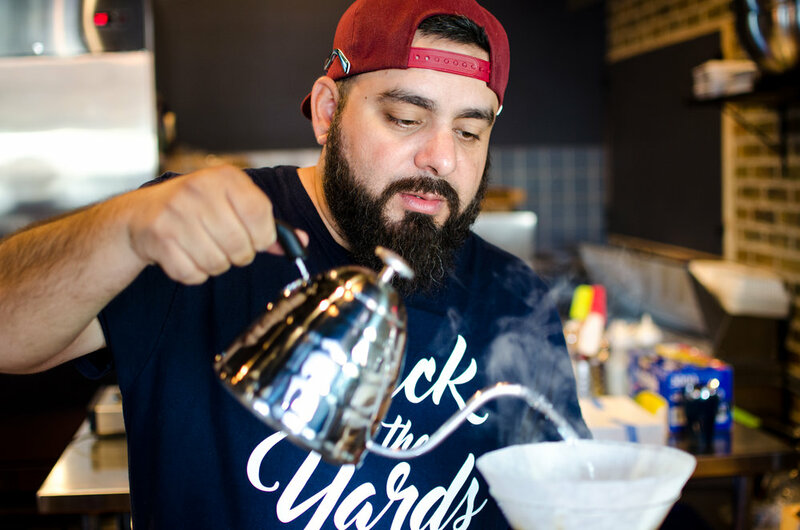 After his first cafe failed in 2008 he opened Back of the Yards Coffeehouse with Mayra Hernandez, who is also from the neighborhood, in 2017. Tell me a little about yourself. What did you do before the coffee shop? How did you meet Mayra? I was born and raised in Back of the Yards, and have pretty much lived here most of my life. My parents arrived here from Mexico in 1979 and I was born two years later. My father worked at Edsal Steel Manufacturing in the Stockyards Industrial Park a few blocks away until he retired. Most of my family has moved out of the neighborhood but I planted my roots and bought a house here. My background is in community relations and marketing. Prior to starting the coffee company, I was working in a multicultural marketing firm doing marketing and outreach work for the State of Illinois' health marketplace under the Affordable Care Act. In my "free time" I've organized in my community around immigration and civic engagement. I have been involved in organizing in Back of the Yards since I was a teenager. That's how I met Mayra, we were part of a Mariachi program that brought music instruction to our community. We both have deep roots in our community and actively maintain those relationships. You ran a different cafe before the economy crashed in 2008. When did you and Mayra know you wanted to open this cafe? And why did you want to try again with coffee instead of a different business? When Mayra first brought up the idea to open up a coffee shop in the neighborhood, I was unemployed and she was underemployed. I had no appetite to get back into the coffee business because of my past experience with the coffee shop in 2008. I had opened up the shop not knowing that the housing and stock markets were going to crash. We gambled on a neighborhood we knew nothing about and learned the hard way to do a lot of research before settling on a location. When we first began discussing the idea, we talked to friends and neighbors to get a feel for whether or not this was something the community wanted, we did some research and began writing our first draft of our business plan. As we began to embark on this journey, a lot of things started to come together. The experience from the first cafe was critical in that I learned not to make the same mistakes. It also gave me a starting point, in experience and resources that helped shape this business. However, we also wanted to do things differently. My experience with coffee and coffee shops was that coffee is a fuel for creativity and coffee shops are community hubs where people gather to discuss ideas, create, and share their creativity with others. It's almost like a bar, minus the alcohol. However, often times coffee shops signal the beginning of gentrification, so we wanted to make sure we were catalysts for the opposite. So we developed what we call our SEED mission (coffee beans are actually cherry seeds): which stands for Social Impact, Economic Impact, Environmental Impact and Direct Sourcing. We do all this by donating part of our proceeds to programs that promote peace and education in Back of the Yards, we hire and buy locally, we use compostable packaging, paper and plastic products (including our straws) and we source directly from farmers. What was the initial community response to the cafe opening, and how does the community view it today? Unfortunately we did not have the support of the local alderman when we applied for a city grant, and he made it difficult for us to access those funds, so in turn we went to our community and the online community for support. Our goal was to raise $10,000 and we ended up raising $17,000. We received contributions from all over the country and in different amounts but the majority of the funds came from within the community and in the form of $5 and $10 contributions. What that showed us was that there was a need in the community and that they supported us, but we just didn't know to what extent. When we opened our doors, we had a line out the door all the way past the parking lot and into the alley. We had to close the line at 3 pm because we were running out of supplies that we had bought for the entire week. Today, at any given time you will find students, professionals, mothers, children families, both from around the block or from the other end of the city, to visitors from out of town. We've found that people want to give back and be part of something, they know that by supporting our business they are helping fund programming in Back of the Yards and helping employ young people from the community. It feels good to be part of something that is bigger than us. Where do you source your coffee from? What kind of impact has that had for the people involved? We source our coffee from all over the coffee belt, from Honduras to Brazil and all the way to Ethiopia, but our biggest accomplishment when it comes to sourcing is our relationship with farmers in the highlands of Chiapas. As we were having our initial conversations and practicing on our cold brew, a woman we knew for 7 years casually mentioned to us that her family are coffee farmers in Chiapas and asked [us] to make the introduction. She took us out there and we met the family, amazing hard working people and decided we would try to figure out how to work with them. That journey led us to learn about the coffee process and route and through our partnership with our exporter, we will help them innovate their farms to make them more sustainable and profitable to them, while also maintaining the quality. Our goal is to get them from producing only 3 sacks per hectare to 40-60 bags within 3 years. Left: Mayra checks a coffee plant in Chiapas. Middle: the menu board at the cafe. Right: outside the coffee shop. Is 47th Street Blend available anywhere else in the city? Are you working on expanding your distribution footprint? Our 47th Street Blend and our Butcher's Blend Espresso as well as our seasonal single origins are available throughout the city and suburbs at various coffee shops, restaurants and grocery stores. We are currently working on expanding our footprint, having just recently partnered up with a local distributor. We are also working on being showcased in a national retailer. Where do you want to take Back of the Yards Coffeehouse in the future? Our goal is to expand our footprint in other retailers, coffee shops and restaurants, but also expand to build coffee shops where other retailers won't, using our community based model so that we don't spark gentrification but rather help revitalize communities by hiring locally and contributing to causes in the communities where we set up shop. We'd like to continue to develop more products and can/bottle our famous cold brew and syrups. If you enjoyed this interview please consider supporting me on Patreon.